Since the Hannah Poling case, the subject of autism and mitochondrial dysfunction has been the focus of much attention and research. This includes the CDC and NIH who are currently investigating the role of vaccinations in mitochondrial dysfunction and autism. Mitochondria are the body’s “powerhouse” organelles. They are located inside cells are produce energy throughout the body. Mitochondria use 80% of the available oxygen. Mitochondria are normally inherited exclusively from the mother. These important structures can be damages by REACTIVE OXYGEN SPECIES (ROS), better known as free radicals. Children with autism have very high levels of free radicals and deficient levels of antioxidants. Antioxidants help protect the body, and mitochondria, against damage from free radicals. Other chemicals can damage mitochondria. You don’t have to look very hard into toxicology research to find toxic substances that will damage mitochondria. Thimerosol and other metals damage mitochondria putting children at risk for autistic regression. Drugs can also damage the energy production capacity of the body by negatively impacting mitochondria. Vaccines and drugs can damage mitochondria and 20% of children with autism are estimated to have mitochondrial dysfunction. Mitochondrial research is beginning to identify a significant subset of children with regressive autism who were at risk. The important strategy now is to identify if your child is at risk before submitting to a regular vaccine schedule. The CDC recommends speaking with your MD about vaccination concerns. Naturopathic intervention for autism includes a functional approach to treatment. Each child is assessed and treated individually which increases success rates. The reason naturopathic treatmetn of autism helps so many children is because it addresses underlying weaknesses in the system. Research has identified a number of biochemical and physiological abnormalities in children with autism. Through evaluation, theses impairments can be identified and treated with safe, effective, natural remedies. Some of the underlying weaknesses that leading autism researchers have identified include immune irregulatires, mitochondrial dysfunction, dysbiosis or imbalance in bowel flora, detoxification impairments and methylation defects. The most successful biomedical treatment for autism and other developmental disorders is correction of methylation defects. When babies are conceived, they are de-methylated, as development progresses, it does so through the process of methylation. The use of methyl-B12 to correct the methylation cycle that fuels development can have a dramatic impact on social, cognitive and language development. B12 works by increasing “fuel” to the brain and by regulating key neurotransmitters (brain chemicals) that are responsible for learning, memory, mood, behaviour, sensory perception, processing information, relaying information, emotional responses and fundamental brain function. Researchers have identified a number of abnormalities with serotonin, dopamine and GABA. These neurotransmitters can be regulated through support of the methylation cycle. B12 and methylation treatment is one example of how naturopathic treatment of autism has the ability to greatly enhance development. Dr. Doherty will speak about her extensive experience treating children with developmental delay. 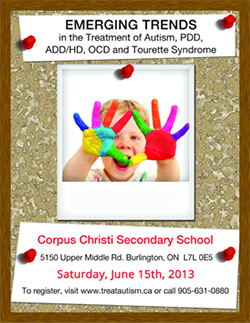 She will explore some of the research into ASD, AD/HD, LDs and other developmental disorders impacting Canadian children. Dr. Doherty will speak about the role that special diets, digestion and immune irregularities, detoxification of heavy metals and nutritional intervention play in the enhancement of social, cognitive and language development. Dr. Carissa Doherty is one of few Naturopathic Doctors who have specialized undergraduate training in toxicology and biochemistry. She will speak about her uniquely designed protocol for prevention of developmental delay. Prevention of developmental disorders begins before pregnancy. It is estimated that 1 in 5 North American children has a diagnosis of developmental delay. With Dr. Doherty’s expertise on detoxification and protecting against environment toxicity, this talk is a must for all parents planning pregnancy. Dr. Patterson is a graduate of the Canadian memorial Chiropractic College. She continues to further her training in the area of Pediatric Chiropractic Care. Her lecture will focus on new research linking birth trauma to developmental delay and factors that contribute to traumatic birth as well as treatment options. If you are interested in having Dr. Doherty speak on biomedical treatment of developmental disorders, please contact [email protected]. Biomedical treatment has the potential to change a child’s life. It is the right of every parent to know their options. Treatment of biofilm is an important new strategy in enhancing development for children with autism. When children improve on anti-microbial protocols, it is important to consider biofilm as a factor in treatment. Biofilm occurs when these microbes link together. The connections between microbes are very difficult to break down and account for some of the mucous that occurs during a kill protocol. Biofllms are technically a polysaccharide-type matrix (mucous) secreted by bacteria and yeast. These pathogens create a biofilm to defend against the host’s immune system. Opportunistic bacteria and yeast secrete toxins. These toxins can contribute to behavioural issues, digestive concerns and impair development. An example of biofilms is dental cavities. Bacteria in the mouth can produce biofilms which lead to cavity formation. Parents whose children have undergone treatment to break down biofilms in the digestive tract describe bowel movements with copious amounts of mucous. Once the mucous is passed, dramatic shifts in development can be seen. Research supports a connection between the digestive tract and development. Microbes in the gut can change the way the body functions. Identifying and treating biofilms is an important strategy in biomedical treatment of autism spectrum disorder, AD/HD and other developmental concerns.